ecotourism in tropical rainforest: experience the real jungle! Khao Sok's jungle is one of the oldest tropical rainforest in the world (older and richer than the amazonian forest). Here you can find around 50 different species of mammals, 300 species of birds, many batrachians and snakes and a still unknown number of insects! A paradise for any nature lover! 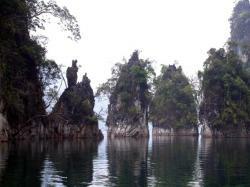 Khao Sok National Park, created in 1981, is a 739 km2 reserve, part of the largest wild forest of South Thailand. Chew Larn Lake (also called Rachaprapha, from the name of its dam): a huge and convoluted artificial lake from which rise wonderful limestone's cliffs. Mysterious and so spectacular that some prefer it to the well-known Ha Long Bay. The gibbons: fascinating monkeys with such an amazing call. The rafflesia: the largest flower in the world (endemic specie) which is a parasite living on some specie of liana.